Whew – I’m beat! Tomorrow is my one day off a week, and I had plans to take advantage of being able to sleep in past 3am tomorrow morning by staying up a bit later to get a few things done. One item was a planned blog post for this evening… but I’m thinking it will have to wait. I spent this afternoon working in the vegetable garden, weeding and preparing the bed, laying out the paths, and planting a portion of my home-grown-from-seed plants (fingers crossed that we’ve seen the last of the frost till the fall). The afternoon was nice and relaxing, and a great way to wind down after the work day; but what with getting up at 3am, working a full day including an hour commute each way, then three hours in the garden under the bright sun, by the time 9 pm rolled around I found myself tireder than I had expected. So I think I’ll call it a night; the soft covers of my bed beckon. The planned blog post can wait till tomorrow – it’s my day off, after all. In the meantime I’ll share this snapshot, which I’d planned for Sunday but will use today instead (I’ll put something more substantive up on Sunday). This is sunrise from a few days ago: the silver lining to the dark cloud of a 3 am wake-up call. 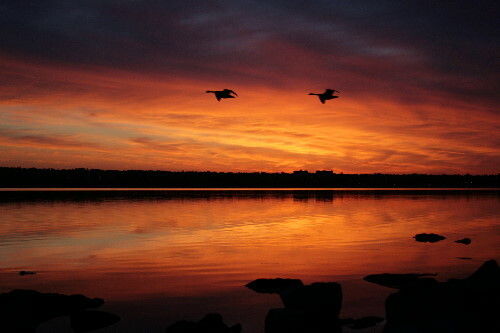 As I was hunkered down by the shore trying to get a good photo of the sunrise reflecting on the Ottawa River a pair of Canada Geese most obligingly flew by. I got just a single frame with the birds in it – but I thought it turned out pretty well. The birds in the sunrise photo are of what kind besides “earlybirds”? Gorgeous. Almost worth getting up for…almost.